Legal History Blog: Aroney et al. 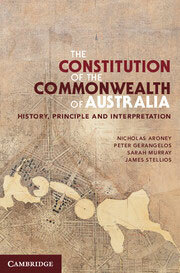 's "Constitution of the Commonwealth of Australia"
Aroney et al. 's "Constitution of the Commonwealth of Australia"
This book examines the body of Australian constitutional jurisprudence. Its aim is to be original and rigorous yet accessible. It begins by exploring the historical and intellectual context of ideas surrounding the Constitution’s inception, and closely examines its text, structure, principles and purposes in that light. The book then unpacks and critically analyses the High Court’s interpretation of the Constitution in a manner that follows the Constitution’s own logic and method of organisation. Each topic is defined through detailed reference to the existing case law, which is set out historically to facilitate an appreciation of the progressive development of constitutional doctrine since the Constitution came into force in 1901. The topics taken up in the first chapter, “The Constitution,” are historical origins, political development, institutions and principles, and constitutionalism in practice.